This week for my triumphant, yet extremely lazy return to my normal blogging schedule I have a special review of the latest Influenster VoxBox. 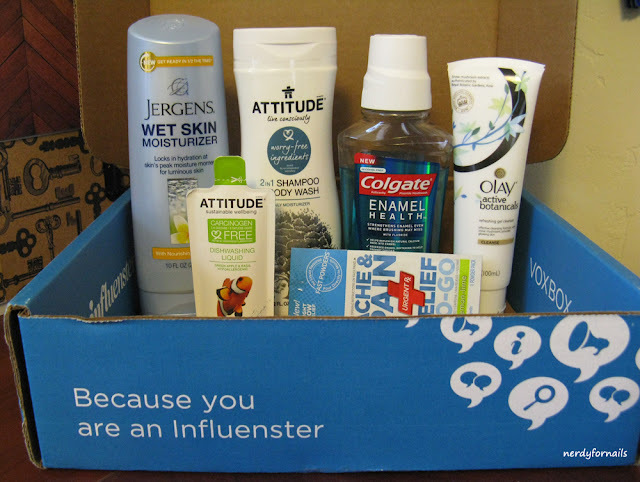 This Wellness VoxBox has a variety of drugstore items sent by Influenster for me to review. Though the items were complementary I guarantee that all opinions are my own. So lets get started with some of these items before I show you which one inspired today's nails. Jergens Wet Skin Moisturizer: I'm not a huge fan of this product. The concept is ok. You're meant to rub this stuff on in the shower before you dry off- no rinsing necessary. They say your skin absorbs 2x the moisture when it's damp with half the drying time of normal lotion, so this product should moisturize better and more quickly if the claims are true. I couldn't bring myself to actually test it though because the smell! I'm very sensitive to perfumey smells and this one was really floral which is the worst for me. I hope Jergens comes out with an unscented version for us sensitive people. Attitude Hair Care 2in1 Shampoo/Body Wash & Dish Soap: I actually really like this one and my husband agrees. It has a really great fresh smell (not too overpowering for my sensitive nose). The big draw of the Attitude brand is their worry-free ingredients. I find that a lot of the "natural" shampoos don't lather well and leave my hair feeling and looking greasy, but not this one. It makes a ton of great lather and leaves my hair feeling nice and clean. This is something I'd seriously consider buying in the future. At $9.99 for a good sized bottle it's worth checking out. Attitude products are available at Target and online at Attitude (check out all their products there). The dish soap has similar lathering abilities and the smell is exactly as described- green apple & basil. I personally find it a little weird to wash food off dishes with something that smells like other food, but it's a pleasant smell and the soap works well to cut through the grease/stuff on the dishes. Colgate Enamel Health Mouthwash: In the Colgate vs Crest battle I'm a Colgate girl all the way so I was happy to try out this mouthwash. I like that this mouthwash is alcohol free (the husband complained that it didn't burn enough). I can't take the sting of the ones that have alcohol so this was nice for me. The flavor is nice and fresh. I'm super paranoid about my dental hygiene. I won't use anything with artificial sweeteners before bed (yeah.. I'm one of those weird people who makes their own natural toothpaste to avoid that stuff). I do, however, use this in the morning or before leaving the house. As far as claims that this can help reverse enamel softening... I don't know how I'd really test that out, but I'm sure it can't hurt. Dental hygiene for the win! UrgentRx Ache and Pain Relief To-Go: This stuff is a fast dissolving powder that doesn't require water to take... but ohhhh believe me, you'll want some. The flavor could easily be described as woahhhhehhhhhblehhgh... aka lemon lime. I can't really blame the makers though. Aspirin is really bitter and it would be extremely difficult to mask that flavor entirely. They tried really hard with a ton of artificial sweeteners that stuck in my mouth long after the powder had dissolved. On the plus side, it did dissolve really quickly. The packaging is small and flat making it easy to keep in your purse/bag for some kind of headache emergency. 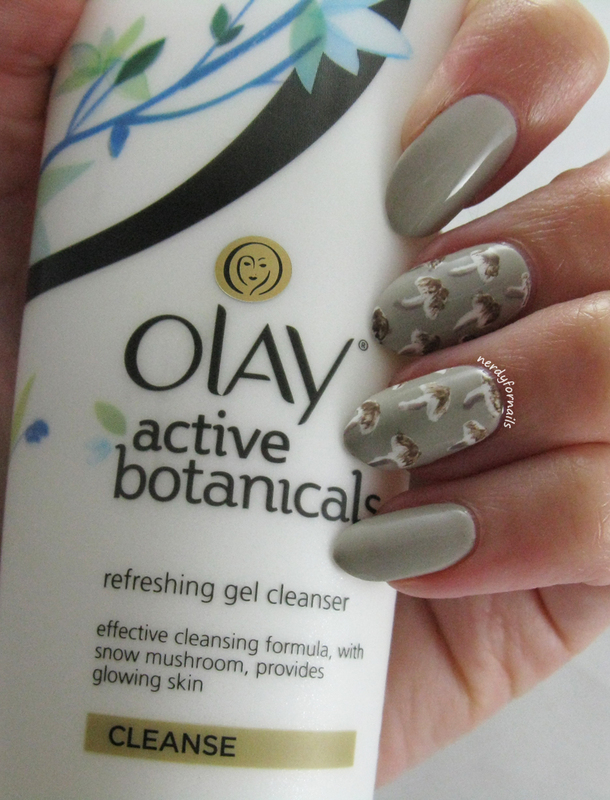 Olay Active Botanicals Refreshing Gel Cleanser: Finally, a peek at the nails inspired by this product. I'll give a closer look at the nails in my next post. For now here's what I think about this cleanser. It's infused with snow mushroom which is said to hold 500x its weight in water. I'm not sure how that helps clean your face. Possibly some kind of moisturizing effect? I've been using this for the last couple weeks and it's doing a nice job. I don't know if there are any noticeable differences in my skin, but on the bright side it hasn't caused any horrific breakouts which is a valid concern with my sensitive skin. I was previously using an Oil of Olay sensitive skin face wash (unscented with aloe). One of the major differences I've noticed is that this Active Botanicals gel has a slight scent (nothing too strong, but as you might have noticed from my endless comments I usually prefer unscented products). It's also a little "slimy" feeling when I rinse it off. I think that because it's a clear gel it takes a little extra rinsing to get all the soap feeling off. This is definitely nice and I like that it makes me think of adorable little mushrooms while I'm washing, but I think once I'm done with this tube I'll probably go back to my old favorite Olay face wash.
Yaye: Also in this VoxBox is an invitation to download a new health and fitness app, Yaye. Once you download the app you can connect with your friends to set fitness goals and encourage each other because "it's no fun working out by yourself." It's been my long-standing motto that pain is your body's way of telling you something is bad for it. And exercise hurts.. so obviously you shouldn't be doing it. Flawless logic, yes? I do already have a Fitbit which comes with its own app and a bunch of friends to "motivate" me and it hasn't done much good yet. The advantage of the Yaye app is that it's free whereas the cheapest Fitbit is around $50. If you're looking for an inexpensive way to have "fun" exercising with your friends this could be a really good option. I may still try it out just to see how I like the app. I could use all the help I can get at this point. What do you think of this VoxBox? Anything you'd be interested to try? If you want to join Influenster so you can try out products for yourself click my link in the sidebar to get more info---> or let me know and I can send you an invite.